1. 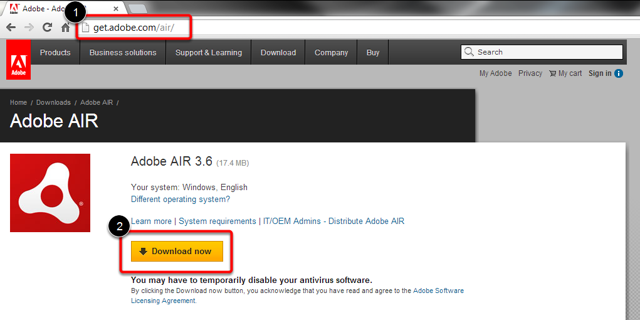 Download Adobe AIR directly from the Adobe AIR Download Center at http://get.adobe.com/air/. 2. Click Download Now. This step downloads an Adobe AIR installer file to your computer. 3. Run the installer file. For example, on Windows computers, double-click the installer file to run it. Administrative access is always required for installation of Adobe AIR. However, you can install an Adobe AIR application without administrative access in a location that is writeable by the current user account. If you do not have write permissions, contact your systems administrator. After you have successfully run the Adobe AIR installer file, try again to install and run the POS application.